“Masterchef”, a reality TV show where amateur chefs battle it out to emerge as sole victors. In the season 9 iteration of the show aired in 2017, Sarah Tiong was one of the few select contestants to advance through to the “Japan Week” special and take part in the unfolding climax (aired July 2017). I decided to sit down with Sarah and find out what her experience in Japan was like and what her aspirations for the future are. Q: When did you cook your first dish? A: My mother was born in a small village in east Malaysia and came to Australia in her teens. She has always been a battler, working 7 days a week whilst also making sure she cooked for the family every day at home. I always watched her as a child and began to cook with her from a young age. She made traditional Chinese Malaysian dishes and it was through her that I learned, not only how to cook, but to respect food. I was probably around 14 or 15 when I actually started cooking properly. The cook who has influenced me most is definitely my mum. Q: What line of work were you in before you appeared on Masterchef? specialist, amongst other roles. Only amateur chefs can apply to be on Masterchef. I’ve never even worked as a waitress at a restaurant, let alone in a kitchen and have only ever cooked at home with my mum, or cooked for other family and friends. Q: You have a successful career as a corporate lawyer. Why did you decide to take the leap into the world of cooking? After filling out my application, I went through the cooking tests just like you see on TV, and auditions, before I was eventually chosen to be on the show. I left Sydney and spent 8 months in Melbourne where the studio was. My mum was against it at first since she’s rather protective, but once the show began to air, she told me, “This is a once in a lifetime chance,” and gave me her support. On each episode of Masterchef, contestants compete to show off their cooking skills and ideas with a variety of different ingredients and restrictions. The premise of the show is simple, but ruthless – as the episodes progress, low scoring contestants are eliminated one by one, leaving the last person standing crowned champion. Sarah progressed through to the “Top 9” and took on “Japan Week” towards the end of the season. Q: What experience in Japan left the biggest impression on you? A: I had only been to Japan once before appearing on the show. A few months before filming started, I went on a two week holiday to Tokyo and Osaka. All I did was eat the whole time (laughs). We filmed for 17 days on location, but when I had some time in between shoots, I got to eat a lot of delicious food with the other contestants. Many of the other contestants had never been to Japan before so they were quite excited. One place that really struck me was a tempura restaurant in Tokyo. We were just walking around and then randomly dropped by this place, but the tempura they served to us as we sat at the bar was absolutely delicious. The moment we took a bite into the crispy batter, the rich seafood umami just came bursting out. We were all at a loss for words. It was completely different to any tempura I had ever had in Australia. The third episode of the Japan Week special was shot at a tea farm at the base of Mount Fuji. In this episode, where contestants were given the difficult task of using tea as an ingredient, Sarah won the challenge by creating a modern interpretation of the traditional Malaysian soup, “bak kut teh”. She earned herself an “immunity pin”, which contestants can use to escape elimination just once. However, in the next episode she found herself in danger of being eliminated. In episode 50, the climax of the Japan special, Sarah decided against using the pin and put all her money on a modern Malaysian “steam boat”. She earned high praise from the judges and clawed her way back from the brink of elimination. Q: During Japan week you turned traditional Malaysian dishes passed down to you from your mother into new, modern dishes. Did you decide against using the immunity pin because you were confident you would win? A: I felt as though my cooking skills jumped up a level during our time in Japan. My experience had reached a new high standard, so I figured I should cook my way out of elimination rather than try to run away from it. I used pork belly in both the bak kut teh and steam boat dishes. I stuck to the basics of these dishes that have been passed through generations before reaching me, and tried to give them a new form. It was quite difficult since there is a small window to make the pork belly tender. If it’s not cooked long enough, or cooked for too long then it becomes tough. However, if it is cooked even longer then it falls apart. My mum knows the perfect time to cook it, but I couldn’t quite remember how long… It was all or nothing and I just happened to pull it off. 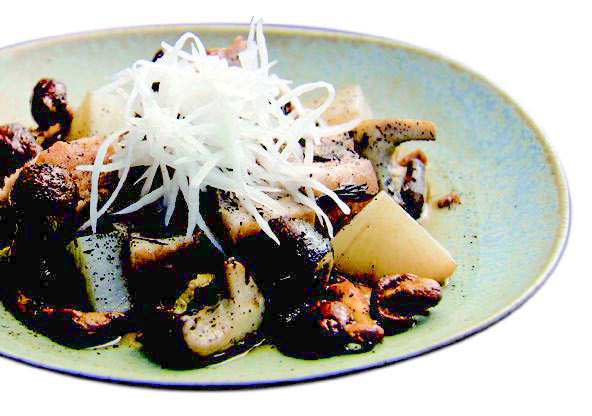 Japanese cooking in my own dishes. Q: What appeals to you about cooking? between one another and share in the love and joy. Q: What are you up to these days and what are your aspirations for the future? A: I run a pop-up market stall called “Pork Party”, which sells pork-based dishes, and I’ve done quite a few masterclasses and promotions with Westfield, Simon Johnson, and Australian Pork. On my official website, I’ve been uploading videos of recipes and food. Since I’m working part time as a lawyer, whilst doing food-related jobs, I don’t have any days off (laughs). I’d like to open up a restaurant specialising in pork one day. It would be great if I could create a TV show based on food and travel, where I could travel the world and cook with local ingredients at each destination. I’d love to become someone with my own successful line of products, like Jamie Oliver. Someone who can share their culture around the world. SARAH TIONG – as a Lawyer and Risk Specialist, she has spent most of her professional life providing advice to Australia’s biggest players in financial services and international businesses. Sarah loves food and her passion is driven by sharing delicious meals with others. 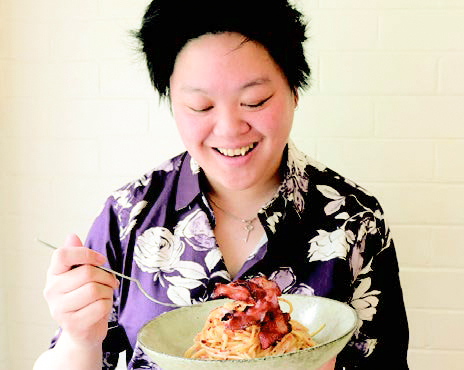 She found herself as a finalist on MasterChef Australia Series 9 in 2017 and her life has dramatically changed since then. With a love of homecooking and traditional recipes inspired by her mother, Sarah takes traditional, childhood recipes and elevates them with elegance and technique. She runs a market stall called Pork Party offering porkbased family favourites, caters events, engages with brand promotion and strives to share her food learning experience.